There seem to be a lot of things that this date—the day after Christmas—means to different people, depending on the calendar you check or the culture you are surfing. It’s the 360th day of the year, so if days were degrees, we would all be arriving full circle. In most European countries and Western Christian traditions, today is St. Stephen’s Day, or the Feast of St. Stephen. He was the first martyr—the protomartyr—in the Christian Church. He was the one who stood in front of the Temple in Jerusalem and railed against the hypocrisy, greed and misguidedness of the Temple priests. Worse than that, he placed the recently crucified and very controversial figure of Jesus Christ at the right hand of the Jewish God, which was a very intense kind of blasphemy to the council of Elders whom he was addressing. For his troubles, he was allowed to get really, really stoned, and not in the good way. In Ireland, they recognize the Feast of St. Stephen, of course, but also something called Wren’s Day, or the Day of the Wren. This apparently involves hunting wrens (or fake wrens, these days) and mounting them on decorated poles, and involves crowds called mummers or strawboys, masks and gaudy clothing, parades and music. Whether it can be traced to Celtic or Saxon influences, it doesn’t really matter because it sounds like a heck of a party. New Orleans, we should look into this, it sounds like our style. I’ll have our people call Ireland’s people. In many countries—chief among them being this one—this day marks the biggest shopping day of the year, or certainly right up there, for those who keep track of these things. I think I heard this morning that there will be an estimated gazillion billion dollars in gift returns worldwide. That’s not the real figure, because I can’t remember it, but you get the idea. Another thing we like to do is go to the movies the day after Christmas. Something about all of that grueling bargain hunting and exchanging makes us just want to escape into the dark of a theater and the light of the unreal. And there’s the fact that it’s a Friday. The way the calendar fell this year, I suspect many nine to fivers are simply taking advantage of their very long weekend and just taking it easy after a long week of stressful family politics and event wrangling. You may be spending your day in honor or in service to any of these things, and there is certainly nothing wrong with that. I am mostly of the latter frame of mind. Exhausted by my week, exhilarated by my month, mystified by what was for me a very strange year, I spent most of my morning and afternoon stupefied and dead eyed on the couch. I was also mentally blacked out, in regards to this dispatch, and had just no idea what on earth I had to say today. I took a walk around the block in hopes of finding inspiration, for ideas, for words, for pictures. 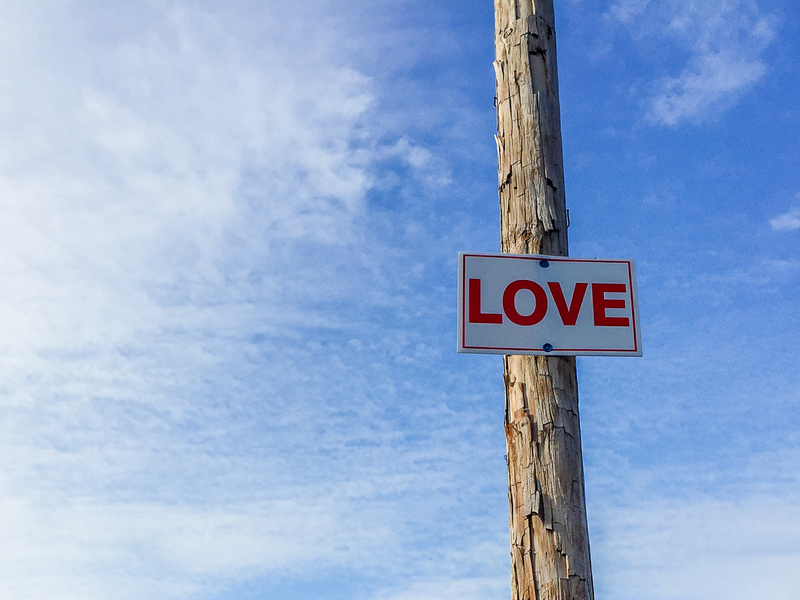 Then I looked up and saw it, a single white placard with red letters mounted high up on a telephone pole. It wasn’t the first one I had seen. I believe someone is posting these up all over the neighborhood. It’s not an original thought. But it may, in fact, be the original thought. I took one photograph, with my phone, and am posting it here for you. It’s a good reminder, on the day after The Day, what all this year-end reckoning really ought to teach us, or remind us, to remember. “Self-titled” Marginy, New Orleans. 12/26/2014. Format: digital via iPhone 6.